Let's look at this realistically, shall we? Your heart is literally a bloody, pumping muscle in your body! Sure, it's a vital source of living, but the "follow your heart" gag doesn't mean to let the muscle guide you through life. I'm sure you're thinking, "c'mon, stop taking it so literally. We all know it's not actually talking about the muscle in my body." 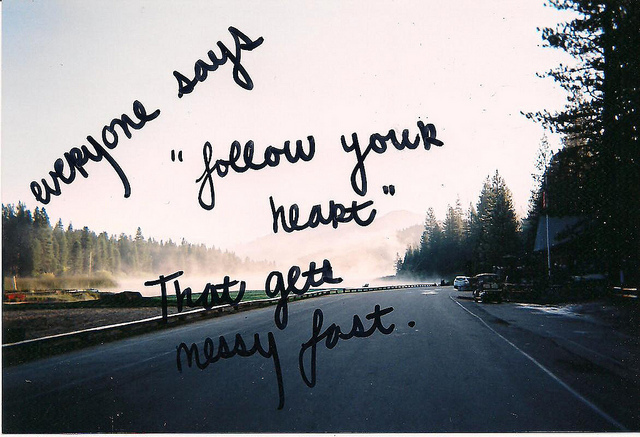 Okay, I'll stop, but since we're on the subject... what does the "follow your heart" quote actually mean? Doesn't it mean that you should follow your emotions? what your feeling on the inside? Ha! My brain flew back to the last time I had an emotional breakdown. Not very pretty. So yeah, no. I don't really think following my emotions would be the brightest idea... Most importantly, doesn't the Bible itself say, "The human heart is the most deceitful of all things, and desperately wicked. Who really knows how bad it is?' (NIV) I think that about sums it all up. "God just wants me to be happy." A couple of weeks ago I was asking one of my friends if they were going to play basketball this year on our varsity high school team, and they answered that they probably wouldn't. When I asked them why (I knew they loved the sport), they replied along the lines of, "Because I don't think it'd make me happy. And that's what God wants, right? for me to be happy?" I had to disagree wholeheartedly. I answered, "No. I mean, yes, we have to be content in life, but that doesn't mean we'll always be happy." They fired back with a mutter about contentment and happiness being essentially the same thing. Again, I couldn't agree with what they were saying. Being content isn't always a feeling, whereas happiness is. Happiness is an emotion, one that we can't let rule us (aha! following what we feel (our emotions) shows in the silver-lining of this philosophy as well). Contentment is the "act of making contentedly satisfied" (Dictionary.reference.com/browse/contentment?s=t). It's an action, not a feeling. To ease your doubts of never feeling satisfied, an evangelist I know that goes by the name of Ben Everson once said, "Right feelings follow right actions." Is being happy really what God made us for, anyway? In the Bible it tells us that God created us in His own image to glorify Him. We were fashioned together to worship in everything that we do. Yeah, I know. It'd be nice if God just all wanted us to be completely happy, but by being happy all of the time... I believe as humans we'd forget that we need Him to satisfy us. We'd get so caught up in our own perfect little worlds that we may forget that this earth isn't our home, and this temporary happiness that we occasionaly feel is nothing compared to the joy that God gives us through Him. Please, leave a comment or two! I'd really love to hear from you.